Welcome to this spooky HR Blast, in just two minutes we look at unravelling the myths behind some of the Halloween horrors in your team! Medusa is your customer services team leader. She runs a tight ship. But one look can turn her team members to stone! Her team performs well (they are too afraid not to!) but rapid staff turnover is becoming a costly business. The realisation on reflecting on this may surprise them! Exit interviews are also a useful resource in this situation, so perhaps you could bring in HR to conduct these, and find out the crux of the matter. Zandra used to be your top performing sales rep, but recently she seems to have fallen in with the wrong crowd. She now behaves as though Monday is the new Friday, parties hard, and always turns up to work late and looking rather the worse for wear. Her productivity has dropped hugely… she really is the working dead! Bring Zandra back to life by having a performance review meeting with her. Address the areas where her performance is lacking and the pattern of lateness and motivate her by giving her figures/examples of where she used to be the top performer! By addressing these unacceptable standards now, it avoids you having to save all the ‘bad news’ up until you reach the final straw and want her out of the business. Keep file notes and logs of her behaviour and use as many real life examples as evidence to help her understand and address the drop in her productivity. Pete works in accounts, he’s in his probationary period and has only been with you for three months but you have already identified he does not have a head for numbers! Well he does have a pumpkin for a head after all. He’s clearly not up to the job you employed him for, and his performance has not improved even after lots of extra support and training. It sounds as though Pete is in the wrong job, and that further efforts to try and develop him may be a waste of time. If you don’t think Pete is performing, the chances are that Pete is not having a great time of it either! Sometimes it is a case of having to be cruel to be kind so a probationary review meeting is in dire need with a view to parting ways. The good news in these cases is that the risk factor is relatively low with such a new employee. But don’t be fooled by hidden skeletons lurking in the closet that can come out and hit you between the eyes in the form of a Tribunal claim. Be sure to follow a fair and documented process! Of course, if you are feeling in a generous mood, you could always give Pete one last shot and extend his probation, giving him clear direction and objectives of course. 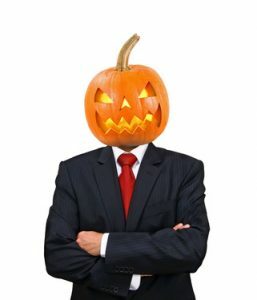 Or if his pumpkin head is a perfect fit but within another area of your business, you may want to consider discussing other jobs for him! Casper works in the maintenance department, and loves fixing things. He’s good at it. The problem is he then launches into great detail explaining to anyone who will listen what was wrong and how he fixed it. So much so that he is viewed by many as quite a nuisance! Casper is passionate about his work and of course we would not want to dampen his spirit, but perhaps he needs to understand that his projects are not always at the top of other people’s priority list. This kind of discussion requires a strong manager and is not for the faint hearted! Communication is key in this scenario, the manager needs to find out why Casper loves to talk so much…perhaps he lives alone, or feels invisible at work (well he is a ghost!) and therefore overcompensates in his working interactions. In engaging Casper in this way, he’ll feel understood, cared about, and more likely to take on board your comments when you gently explain that he can use his tea breaks to chat to his colleagues! To take this up a level, understanding his own personality traits and those of others would help Casper to realise why some people just don’t want to listen. Colourwise profiling (Success Insights DISC) would be a good tool to support Casper in communicating effectively with others. Colourwise is all about going back to the basics of who you are, how you see the world and how that impacts on your behaviour. But of course, if Casper’s chatter is affecting his performance, don’t be afraid to have that conversation. And be sure to keep his to-do list topped up to help keep him out of mischief! If you have any employment issues that are keeping you awake at night, pick up the phone to our friendly HR advice team for practical, commercial advice. 01425 479888, 0118 934 9845 or 0207 096 3355. Or for cost-effective, practical training for your line managers, delve into our Performance Management Bag of Learning! Professional training materials designed by us and delivered by you.